What is the heaviest Pokemon ever? If you're looking for the Heaviest Non-Legendary Pokémon, it is Mega Metagross, weighing in at a total of 2078.7 lbs. However if you're looking for the heaviest Pokémon Overall, it would be Primal Groudon, with 2204.4 lbs. So if you're looking to trip the worlds heaviest Pokémon with Grass Knot, Primal Groudons your next Victim. 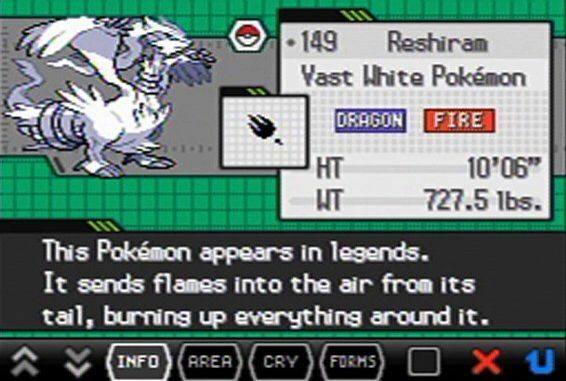 Please note, the publication Pokemon Deluxe Essential Handbook falsely lists Reshiram as having a weight of 6,727.5 lbs -- which would make it the heaviest Pokemon -- when in fact, its weight is 727.5 lbs as the video game itself states. Please note that as outlined in the link above, this handbook is known to contain several errors and is written and published by a third party, not Nintendo or the developers of Pokemon. Additionally, note that Cosmoem and Celesteela have tied with Primal Groudon as the heaviest Pokemon since this answer was posted. It's making an attempt at correcting the answer which is noteworthy enough to warrant bumping the thread. But it's incorrect. I'm going to edit the answer so that it is very clear that this "essential handbook" has made an error. Cosmoem, Celesteela, and Primal Groudon are the heaviest Pokémon in existence. The biggest Pokemon by height is Wailord, at 47'07''(14.5 m). The heaviest Pokemon is Primal Groudon at 999.7 kg(2,204.4lbs). uhhhh, Cosmoem, Celesteela, and Mudsdale? Uhhhh, this question is from 2014? How come in Pokémon White I only ever find Audino instead of Sawk? In ORAS, do Crescent Isle or Cresselia's portal ever disappear? Will the Burned Tower ever be rebuilt? What is the heaviest non-legendary Pokemon? What is the heaviest item you can fling and acquire easily again? What are the ten heaviest Pokemon? What are the 6 heaviest Pokemon? What are the biggest and heaviest pokemon?